While Turkey is situated in a notoriously "dangerous neighborhood"  and is often mentioned as a possible proliferation domino should Iran acquire nuclear weapons, it has relied on the nuclear and conventional deterrence provided by U.S./NATO security guarantees for more than half a century. Turkey's dedication to the nonproliferation regime is further solidified by its commitment to the European Union accession process, as prospects for Turkish EU membership would be gravely diminished should Turkey choose to develop nuclear, chemical, or biological weapons. Thanks in part to decades of U.S. military aid and cooperation, Turkey has robust conventional defense capabilities, including short-range ballistic missiles. Ankara is also working to procure advanced ballistic missile defense capabilities. As part of NATO's nuclear umbrella, Turkey continues to host approximately 60 to 70 U.S. tactical nuclear weapons on its territory at Incirlik Air Base. While there was some speculation in the Turkish press regarding possible conflict between Turkey's leaders and the United States should President Obama's commitment to "seek the peace and security of a world without nuclear weapons" lead to the near-term withdrawal of U.S. nuclear weapons from Turkey, both the 2010 U.S. Nuclear Posture Review and the 2010 NATO Strategic Concept postponed a decision concerning the future of tactical nuclear weapons in Europe. While the Cold War-era B61 bombs serve little military purpose, they provide tangible evidence of a continued American commitment to Turkish security. Turkey does not possess biological weapons, nor is it known to have ever undertaken a biological weapons program. Ankara is a party to the Biological and Toxin Weapons Convention (BTWC), having signed and ratified it in 1974, and is a member of the Australia Group to control trade in CBW relevant items. As a member in good standing of the Convention on the Prohibition of Chemical Weapons (CWC), Turkey does not currently possess chemical weapons, and is not known to have ever possessed a chemical weapons program. Ankara signed the CWC in 1993, ratifying it in 1997, and is also a member of the Australia Group, an export control mechanism to control trade in CBW relevant items. Turkey is a member of the Missile Technology Control Regime (MTCR) and the Hague Code of Conduct Against Ballistic Missile Proliferation (HCOC). Currently, Turkey has a limited ballistic missile arsenal. In November 2012 Turkey requested that NATO supply PAC-3 batteries to defend against missiles and long-range artillery from Syria. The request was initiated over concerns that: 1) Syria's missiles and long range artillery are inaccurate and unreliable and one could potentially go off course and land in Turkey; 2) Syria could intentionally launch missiles and artillery at Turkey; and/or 3) Syrian fighter jets could threaten Turkish airspace. "Turkey Hosts Proliferation Security Initiative Exercise," U.S. State Department, Bureau of International Information Programs, 24 May 2006, www.america.gov. For example, see: Dangerous Neighborhood: Contemporary Issues in Turkey's Foreign Relations, ed. Michael S. Radu (London: Transaction Publishers, 2002). For an analysis of why Turkey is unlikely to pursue nuclear weapons in the foreseeable future, heavily emphasizing domestic politics factors, see: Jessica C. Varnum, "Turkey in Transition: Toward or Away from Nuclear Weapons?" in Forecasting Nuclear Proliferation in the 21st Century: Volume 2, A Comparative Perspective, eds. William C. Potter and Gaukhar Mukhatzhanova (Stanford, CA: Stanford University Press, 2010), pp. 229-254. Sebnem Udum argues that "a nuclear Turkey would be suicidal to Turkey's EU membership bid." Sebnem Udum, "Turkey's Non-Nuclear Weapon Status-a Theoretical Assessment," in The 56th Pugwash Conference on Science and World Affairs: A Region in Transition: Peace and Reform in the Middle East (Cairo, Egypt, 2006), p. 5. Robert S. Norris and Hans M. Kristensen, "U.S. Tactical Nuclear Weapons in Europe, 2011," Bulletin of the Atomic Scientists, January/February 2011, vol. 67, no. 1, p. 69. Lale Sariibrahimoglu, "Turkey to face pressure over US nukes on its soil," Today's Zaman, May 4, 2009, www.todayszaman.com; "Active Engagement, Modern Defense," NATO Strategic Concept, Lisbon, November 19, 2010, www.nato.int; and U.S. Department of Defense, "Nuclear Posture Review Report," April 2010, www.defense.gov. Mustafa Kibaroglu, 'Turkey and Shared Responsibilities," in Shared Responsibilities for Nuclear Disarmament, ed. Scott D. Sagan (Cambridge: American Academy of Arts & Sciences, 2010), p. 27. Stein, Aaron, "Turkey's Airplane-less Nuclear Weapons," Turkey Wonk, 15 April 2014, http://turkeywonk.wordpress.com. "JSF Press Release," Undersecretariat for Defence Industries, 20 May 2014, www.ssm.gov.tr. "Turkey to Order First Two F35 Fighter Jets," Hurriyet Daily News, 7 May 2014, www.hurriyetdailynews.com. Turkish researchers are familiar with the PUREX process for separating plutonium from spent fuel, however, as CNRTC possesses a small nuclear fuel fabrication pilot plant. "Cekmece Nuclear Research and Training Center," Turkish Atomic Energy Authority, accessed 1 April 2015, www.taek.gov.tr. Jessica C. Varnum, "Closing the Nuclear Trapdoor in the U.S.-Turkey ‘Model' Partnership," Turkey Project Policy Paper, The Brookings Institution, June 2013. Nuclear Programmes in the Middle East: In the Shadow of Iran, ed. Mark Fitzpatrick, (London, UK: International Institute for Strategic Studies, 2008), p. 65; "New energy minister: No changes to nuclear policy," Today's Zaman, 7 May 2009; Jessica C. Varnum, "Closing the Nuclear Trapdoor in the U.S.-Turkey ‘Model' Partnership," Turkey Project Policy Paper, The Brookings Institute, June 2013. Emrullah Uslu, "Turkish Government May Approve Construction of a Nuclear Power Plant in April," Eurasia Daily Monitor, 6, no. 53, The Jamestown Foundation, 19 March 2009, www.jamestown.org. "UPDATE 1-Turkey wants nuclear project firms set up this month," Reuters Africa, 21 September 2010, af.reuters.com. "Russia Delivers Funding for New Nuclear Plant in Turkey," Nuclear Street, 6 December 2012, www.nuclearstreet.com; Jessica C. Varnum, "Closing the Nuclear Trapdoor in the U.S.-Turkey ‘Model' Partnership," Turkey Project Policy Paper, The Brookings Institute, June 2013. "Environmental Report for first nuclear power plant in Akkuyu yells out 'don't build it,'" Hurriyet News, 18 July 2014. "Akkuyu NPP JSC," Akkuyu NGS AS, www.akkunpp.com; Jessica C. Varnum, "Closing the Nuclear Trapdoor in the U.S.-Turkey ‘Model' Partnership," Turkey Project Policy Paper, The Brookings Institute, June 2013. Jessica C. Varnum, "Closing the Nuclear Trapdoor in the U.S.-Turkey ‘Model' Partnership," Turkey Project Policy Paper, The Brookings Institute, June 2013; "Turkey to Analyze Japan, S. Korea, and Canada for Construction of Nuclear Power Plant in Sinop," The Journal of Turkish Weekly, April 2012, www.turkishweekly.net; "China has advantage in bid for 2nd nuclear power plant," Hurriyet Daily News, 7 December 2012, www.hurriyetdailynews.com; "Turkey to Decide Which Country Builds Second Nuclear Power Plant," The Journal of Turkish Weekly, December 2012, www.turkishweekly.net. 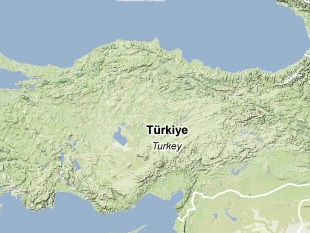 "Town near Bulgaria may host Turkey's third nuclear plant," Hurriyet Daily News, 6 April 2011, www.hurriyetdailynews.com. "Turkey Disproves Reports of Plans to Build Nuclear Plant on Bulgarian Border," 3 June 2011, www.andrey-kovatchev.eu. "Tripartite agreement on third Turkish plant," World Nuclear News, 24 November 2015, www.world-nuclear-news.org. "Turkey Targets 20 Nuclear Reactors by 2030-official," Reuters, 31 January 2011. Erisa Dautaj Şenerdem, "Turkish Experts Split in Atomic Debate," Hurriyet Daily News and Economic Review, 19 March 2011, www.hurriyetdailynews.com. "Turkey to Heavily Invest in its Energy Sector," Andalou Agency, 2 May 2014, www.aa.com.tr; Demirtas Serkan, "Turkey Plans to Operate 3rd Nuclear Power Plant," Hurriyet Daily News, 28 May 2013, www.hurriyetdailynews.com. "Akkuyu Nuclear Plant Will Create 20,000 Jobs," Daily Sabah, 27 April 2014, www.dailysabah.com. Mustafa Kibaroglu, "Turkey's Sweet and Sour Policy Against NBC Weapons," Turkish Policy Quarterly, Summer 2004, www.turkishpolicy.com. Jason Henson, "MGM-140/MGM-168 ATACMS and MGM-164 ATACMS II," Harpoon and Quarters, www.harpoondatabases.com; Andreas Parsch, "Lockheed Martin (LTV) MGM-140 ATACMS," Designation Systems, www.designation-systems.net. Duncan Lennox, "B-611 (CSS-11) (China), Offensive Weapons," Jane's Intelligence, 3 August 2012, www.janes.com. Stein, Aaron, "Turkey's Missile Defense Decision. Ankara will miss NATO Cueing Capabilities," Turkey Wonk Blog, 13 October 2013, http://turkeywonk.wordpress.com. Lale Sariibrahimoglu, "Turkey issues RfP for long-range missiles," Jane's Defence Weekly, 15 May 2009, www.janes.com. Ercan Yavuz, "Defense Giants Compete in Turkish Tender for Long-Range Missiles," Today's Zaman, 2 January 2011, www.todayszaman.com. Giray Sadik, "Turkey Considers Several Missile Defense Systems," Eurasia Daily Monitor 5, no. 87, 7 May 2008, www.jamestown.org. Sebnem Udum, "Missile Proliferation in the Middle East: Turkey and Missile Defense," Turkish Studies 4, no. 3 (Autumn 2003), p.86. Sebnem Udum, "Missile Proliferation in the Middle East: Turkey and Missile Defense," Turkish Studies 4, no. 3 (Autumn 2003), pp. 87-89. Ercan Yavuz, "Defense Giants Compete in Turkish Tender for Long-Range Missiles," Today's Zaman, 2 January 2011, www.todayszaman.com. In March 2013, Israel apologized for the incident; however, relations between Israel and Turkey remain tense and there has been no news on whether the two states will resume joint military exercises: Sara Sidner, Ivan Watson and Joe Sterling, "Israel to Turkey: We apologize for deadly raid on Gaza-bound flotilla," CNN, 24 March 2013. Aaron Stein, "Turkey Wants Missiles Defenses and the Accompanying Design Info," Nukes of Hazard: A Project of the Center for Arms Control and Non-Proliferation, 16 November 2012, www.nukesofhazardblog.com. "US Congress Aims at Turkish Missile Deal, but project already imperiled," Today’s Zaman, 15 December 2013, www.todayszaman.com. "Missile Tender to Conclude by August," Daily Sabah, 27 July 2014, www.dailysabah.com. "Fact Sheet: Patriot Advanced Capability-3," Missile Defense Agency, U.S. Department of Defense, January 2009, www.mda.mil. North Atlantic Treaty Organization, "NATO Foreign Ministers' statement on Patriot deployment to Turkey," 4 December 2012, www.nato.int. For additional background on the politics of the NATO decision, see: Jessica C. Varnum, "Musings on Turkey," Arms Control Wonk, 17 November 2010, http://lewis.armscontrolwonk.com. Piotr Zalewski, "Patriot Missiles Arrive in Turkey: How They Affect the Syria Equation," TIME Magazine, 1 February 2013. North Atlantic Treaty Organization, "NATO Foreign Ministers' statement on Patriot deployment to Turkey," 4 December 2012, www.nato.int. Damien MacElroy, "Syria opposition demands protection from US missile shield; America must use Patriot missile systems in southern Turkey to prevent government attacks on civilians, the head of the Syrian opposition has said as he took over the country's Arab League seat," The Telegraph, 26 March 2013. "Fact Sheet: Patriot Advanced Capability-3," Missile Defense Agency, U.S. Department of Defense, January 2009, www.mda.mil; "Patriot MIM-104 surface to air defense missile system," Army Recognition.com.